After having caused a massive storm with their pop up restaurant at the Towner & Hoxton Gallery last year, The Poachers Pocket are back with a unique dining experience themed around a country lodge style setting! Their bank holiday dinner event parties are bound to be fabulous, so get your walking boots on, or don your best tweed. I will be sure to report back following a visit. What the guys at the Puppet Masters say about it... In days gone by, when times were hard, country folk would forage and poach to feed their family. 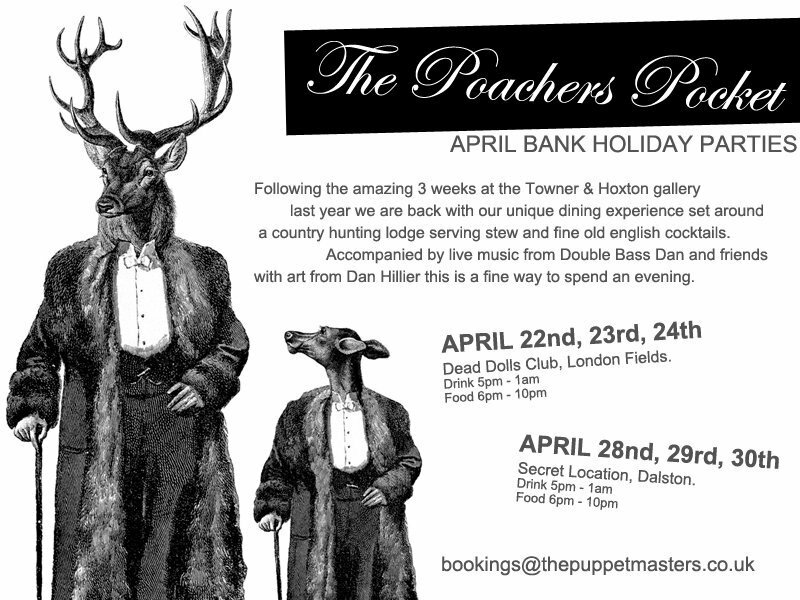 We’ve taken these traditions, fused them with all of the best things Hackney has to offer and created The Poachers Pocket. Come and taste our game based grub and sample our cocktails straight from the poacher’s flask. There will be lots of surprises, unique activities and you may even get a story straight from the poacher’s mouth.